Moist and flavorful, this chicken tagine is an enjoyable dish for family or entertaining friends. 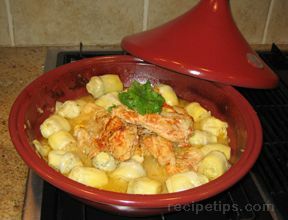 If possible, prepare this recipe in a Tagine baking dish to achieve a very moist and tender result. However, an oven safe Dutch oven or covered baking dish such as a casserole dish can be substituted instead of a Tagine. If used on stovetop burner, make sure it will safely withstand the heat. Using a 2 or 3 quart sauce pan, place 3 cups of water in the pan to blanche the artichokes. Heat water to boiling and allow artichokes to blanche until they are floating which will require approximately 1 minute. Drain and set aside. Zest lemon rind and set aside. Place butter and oil into a sauce pan and heat over medium heat on a stovetop burner. Season chicken with paprika, ginger, pepper, Raz el Hanout, and place chicken into the oil and butter to saute the seasoned meat. Allow the ingredients to cook for 1 or 2 minutes, stirring the food occasionally so the chicken becomes coated with oil, butter and spices. Lightly sprinkle Raz el Hanout seasoning over chicken. Note: Raz el Hanout is a seasoning which is avaiable in some food stores but most often in stores selling foods from India. Combine onion, broth, and saffron with other ingredients. Tie sprigs of parsley and cilantro together with an oven proof cotton string and place on top of all other ingredients in tagine or baking dish. Place tagine or baking dish in oven and cover with lid. Bake for 50 to 60 minutes until chicken becomes tender. When finished cooking for almost an hour, remove tagine or baking dish so chicken can be placed into another oven safe baking dish for warming. Reduce oven temperature to 200°F for warming. Remove and discard sprigs of tied parsley and cilantro that were placed in the original baking dish. The tagine, Dutch oven, or similar oven and stove top safe baking dish now contains the juices which will become a sauce to use as a topping for the chicken and artichoke hearts. Place pan on stovetop burner and simmer on medium heat setting. Add lemon juice and artichoke hearts, stirring lightly so canned artichokes which are most likely pre-cooked will warm throughout. Add lemon zest while stirring. Simmer for 4 to 5 minutes to prepare as a sauce. Lower oven temperature to 200°F and place baking dish with chicken back in oven to keep it warm. When ready to serve, arrange chicken in center of a serving platter with artichokes arranged around chicken. Drizzle sauce over the top of chicken and other ingredients. If desired, garnish with fresh cilantro and parsley leaves.